Nordic Naturals delivers pure, safe, effective high quality omega fish oils in support of optimal health and wellness. As an industry leader and innovator, Nordic Naturals strives to support a better quality of life while maintaining a deep respect for the environment. All products are made exclusively from four types of non-endangered fish: wild-caught Arctic cod sustainably harvested from Norwegian waters; wild-caught anchovies and sardines sustainably sourced from the Southern Pacific Ocean; and wild-caught pink and sockeye salmon from Alaska’s Cook Inlet. Their multi-patented manufacturing and purification processes remove any potential environmental toxins, while maintaining the integrity of the oils. All oils are manufactured in triglyceride form to best preserve the oil and enhance absorption and utilization. Nordic Naturals has advanced fish oil quality by developing patented fish oil technologies that include flavoring, taste, delivery and processing. They utilize proprietary enzymatic and oxygen-free processing technologies to ensure a light fruity tasting product with no burp-back. 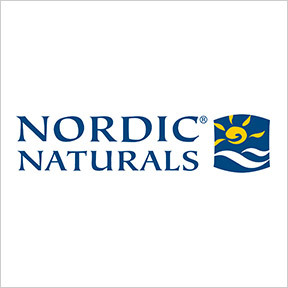 To ensure consistent quality, Nordic Naturals adheres to and exceeds stringent European Pharmacopoeia Standards (EPS), as well as the voluntary standards set by the Council for Responsible Nutrition (CRN), and the Global Organization for EPA and DHA Omega-3 (GOED) for all of their oils. In addition, Nordic® Naturals incorporates ethical and socially responsible practices with regard to environmental consciousness, they support philanthropic work, and are an avid contributor to organizations including Vitamin Angels, Second Harvest, Nourish America and Best Friends Animal Sanctuary. ProOmega Lemon 1000mg: ON SALE Our bestselling product from Nordic® Naturals, ProOmega Lemon provides high levels of omega-3 fats for heart, immune, brain, eye and overall wellness support. Guaranteed freshness and purity. Third-party tested for contaminants, heavy metals, dioxins and PCBs. Naturally preserved with rosemary extract and d-alpha tocopherol. Flavored with natural lemon oil. Free of gluten, milk derivatives, and artificial ingredients. Non-GMO formulation. ProDHA 1000 mg Strawberry: ON SALE This top selling omega-rich formula offers increased DHA potency in support of neurological, eye and nervous system health, as well as healthy mood and memory. One serving provides naturally occurring EPA and DHA. 100% natural strawberry flavoring. Naturally preserved with rosemary extract and d-alpha tocopherol. Free of gluten, milk derivatives, and artificial ingredients. Non-GMO formulation. Arctic Omega Liquid Lemon: ON SALE This easy to use liquid formula provides a natural balance of EPA and DHA to aid in the maintenance of healthy levels of omega-3 fats. This formula is useful for stress management, balanced mood, and neurological function, as well as cardiovascular and immune stability. Naturally preserved with rosemary extract and d-alpha tocopherol. Natural lemon flavor. Purity guaranteed. Free of gluten, milk derivatives, and artificial ingredients. Non-GMO formulation. DHA Infant™ with Vitamin D3: ON SALE Formulated specifically for infants up to 35 lbs., this pure 100% wild cod liver oil formula provides an adequate intake of DHA, essential for proper vision and brain development. Cod liver oil provides EPA and DHA omega-3 essential fatty acids, as well as naturally occurring vitamins A and D. Naturally preserved with rosemary extract and d-alpha tocopherol. Free of gluten, milk derivative and artificial ingredients. Non-GMO verified. Nordic™ Berries Cherry Berry: ON SALE Rich in vitamins, minerals and antioxidants, these great tasting multivitamin and mineral gummies support good nutrition and wellness as part of a healthy diet. Suitable for adults and children over two years of age. Free of gluten, milk derivatives and artificial ingredients. Colored with natural fruit and vegetable juices. Pet Cod Liver Oil: ON SALE Formulated for medium to large breed dogs, this pure omega-3 oil liquid supplement provides EPA and DHA, along naturally occurring vitamin A to help support skin, coat, joints, heart, brain, immune, and eye health. Guaranteed purity and freshness. Naturally preserved with mixed tocopherols. No artificial flavors or colors. Additional formulas available for smaller dogs and cats.